Most Grands Prix are separated for a period of one to two weeks. After the Canadian Grand Prix there were three weeks before the French race and this allowed the teams to hold two big tests, during which the dominant McLaren team began to realise that there was not a great more potential for development. Ferrari was quicker despite the fact that Michael Schumacher had a nasty high speed accident which destroyed his car. Heinz-Harald Frentzen also had a very big accident in his Williams and would suffer from the after-effects throughout the French Grand Prix weekend. 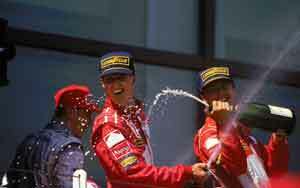 Schumacher qualified only two-tenths slower than pole man Mika Hakkinen while McLaren's second driver David Coulthard qualified third. Ferrari number two Eddie Irvine was fourth. As the lights were about to go out to signal the start of the race Jos Verstappen stalled his Stewart-Ford and Race Director Charlie Whiting tried to abort the start. The FIA software was not fast enough and the lights went out as normal but then the red lights came on again. Both McLarens took off well while Schumacher's Ferrari staggered away. He was fortunate that the race was stopped. At the second start both McLarens set off badly and Schumacher took the lead with Irvine behind him. With Irvine blocking Hakkinen and Coulthard Schumacher was able to build himself an advantage. On lap 21 Hakkinen finally overtook Irvine but then made a mistake and spun, dropping behind Irvine again. Although Hakkinen pitted almost immediately he had ruined his chance to get ahead of the second Ferrari. McLaren's hopes now lay with Coulthard but his pit stop went wrong when the refuelling nozzle failed to connect to the car. By the time he was back on the track Irvine was well clear. The order remained the same until the second pit stops. Once again Coulthard had trouble. His stop was slow and then it was discovered that he had been sent out without enough fuel to make it to the finish. He had to stop again. This dropped him to seventh place. Although Hakkinen put on a charge and began to close in on Irvine he was not close enough to take second although the two drivers crossed the line side by side on the last lap, 20 seconds behind Schumacher. Villeneuve finished fourth and Alexander Wurz fifth while a great drive by Jean Alesi was not rewarded as the Sauber driver was overtaken by Coulthard on the last lap.